Es ist ein Berghaus auf 1.370 m über N.N. Die Auf- und Abfahrt muss man täglich auf sich nehmen, will man nicht nur oben wandern. Aber der Blick von da oben ins Rheintal ist unschlagbar. Was soll ich schwärmen; selbst hinfahren. Es lohnt wirklich, dort zu übernachten, wenn kein Ski-Betrieb mehr ist. Where to find Gonten hotels near an airport? Where can I find hotels in Gonten that are near tourist attractions? You'll find a wide range of Expedia hotels to choose between when booking your vacation in Gonten. Gonten features around 10 hotels and apartments within a short drive of the downtown area. 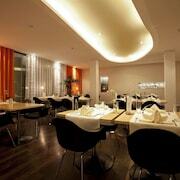 Expedia hotels within driving distance of Gonten include the Romantik Hotel Santis and Hecht. 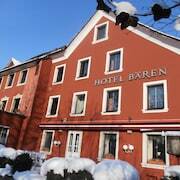 The Parkhotel Sonnenhof can be found 25 kilometres (14 miles) from the center of Gonten. 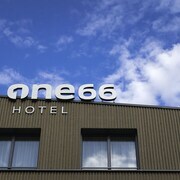 Another hotel is the Residence Hotel, which is situated 25 kilometres (15 miles) away. 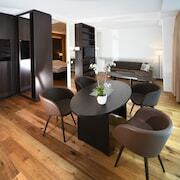 Two other Expedia-listed places to stay in this area are the Hotel Säntispark and the Einstein St. Gallen - Hotel Congress Spa. Looking for more to do? Spend the day discovering Wildhaus-Gampluet Cable Car and Toggenburg Sound East Trailhead, in Wildhaus, 13 kilometres (8 miles) to the south of Gonten. 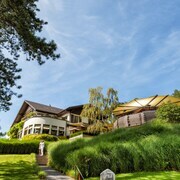 Some of our recommended Wildhaus hotels and accommodations are the Hirschen Swiss Quality Hotel and Saentis. 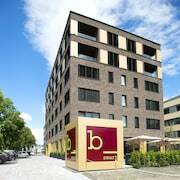 Alternatively, you could stay in Vilters-Wangs, 35 kilometres (22 miles) to the south of Gonten, where you can choose from the Hotel Post and Berghotel Alpina. 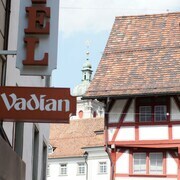 If you stay in Vilters-Wangs, don't miss the Pizol Wangs Cable Car and Seilbahn Pizol Wangs. If watching sport is a favourite pastime, make sure you visit AFG Arena, which is 10 kilometres (6 miles) to the north of Gonten. 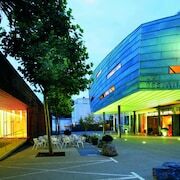 For those who are keen on staying close by, make a reservation in the Sporting Hotel or Landgasthof Säntisblick. 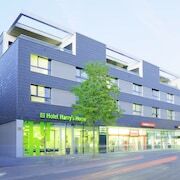 For those travelers planning on arriving or departing via St. Gallen - Altenrhein Airport, you might like to book a room at Hotel Heiden Swiss Quality, or Best Western Hotel Rebstock, which are both conveniently close. What are the most popular Gonten hotels? Are there hotels in other cities near Gonten? What other types of accommodations are available in Gonten? Explore Gonten with Expedia.ca’s Travel Guides to find the best flights, cars, holiday packages and more!